This .22 LR Conversion Kit converts your GLOCK Handgun into a .22 LR. It allows you to shoot inexpensive .22 Long Rifle ammunition so that you can shoot longer and more often. By Advantage Arms - the best kit available! Note: G26/27/33/39 kit will also fit Gen4 Frames. .22 conversion kits are in huge demand and tight supply, therefore, no discounts are available on this item. This .22 LR Conversion Kit converts your GLOCK Handgun into a .22 LR. It allows you to shoot inexpensive .22 Long Rifle ammunition so that you can shoot longer and more often, turns your GLOCK into an ideal pistol for first time shooters and makes a great tool for teaching women and young adults how to safely shoot a pistol without the intimidation of larger calibers such as 9MM and .40 S&W. The Sights are identical to the Glock factory sights that come standard on most guns. As such, the most applicable training sights for LE and self-defense. The front and rear sights are removable Glock OEM sights. The front sight is fixed. The rear sight is adjustable for windage and elevation. The slide will lock open after the last round in the magazine has been fired. Our unique patented magazine design and heat-treated steel lock open insert allows us to offer this special and desirable feature which you can only find on Advantage Arms.22LR Glock conversion kits. All aluminum parts are hard anodized with a matte black finish. Hard anodizing is 3 times thicker than standard anodizing and is as hard as a piece of heat-treated tool steel (RC 60-65). This finish will help to eliminate both scratching and wear. All steel parts are heat treated with a black oxide finish. The barrel is made from either heat treated 416 Stainless Steel or heat treated 4140 steel, depending upon availability. Installation is simple and does not require any modifications to your Glock pistol. Simply remove the Glock magazine and slide as outlined in your Glock owner's manual. Now slide the Advantage Arms slide onto the frame, until it engages with the slide lock. Check to make sure that the slide lock is in its most upward position. Insert the conversion magazine. You are now ready to shoot. This procedure can be accomplished in less than 10 seconds with some practice. 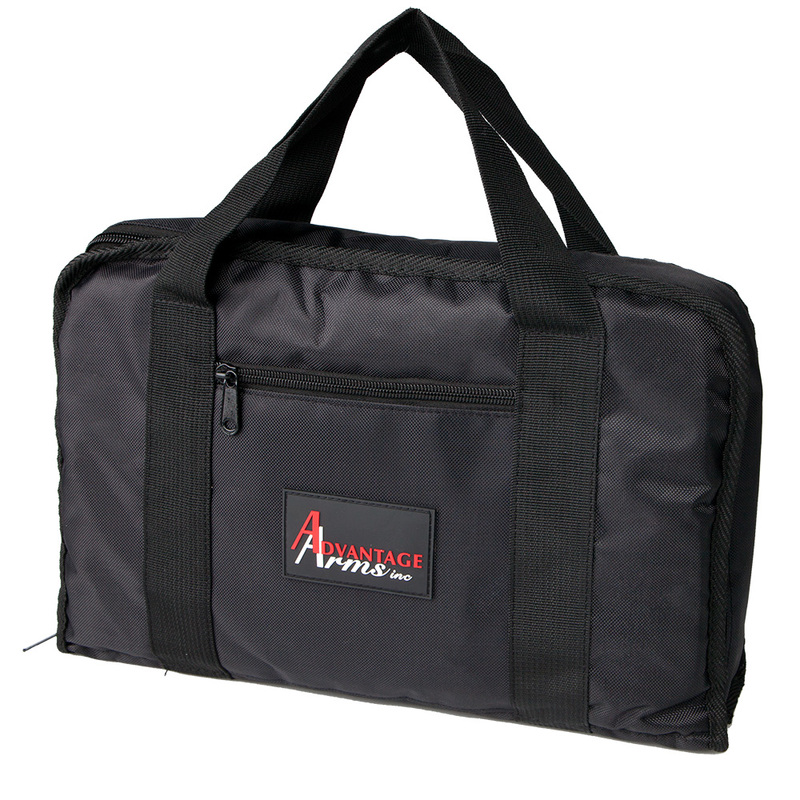 This kit is delivered to you in its own, very nice carrying case that includes, the .22 caliber upper, 10-round magazine, and magazine loading tool. Be sure to order extra magazines! Please note: No discounts are available on the purchase of this item. Discounts will only apply to accessories and parts. Took this the range today and had a blast. Ammo for this is inexpensive and was able to shoot for 2 hours. Only had one stove pipe, 3 double feeds and one misfire this happened with the two mags. Probably just breaking in. The rest of CCI mini mag 400 rounds worked perfectly. Sights are good no problems hitting targets. Now my wife can work her way up to a 9mm with the same gun. Make sure you get extra Mags. Advantage Arms conversion kit...............The Best !!!!! Its everything you would hope it to be. Bought this for my wife to learn how to shoot her 23 before experiencing 40 cal recoil and noise. The machining is superb. Fits like it came from the Glock factory. The design is in keeping with Glock styling to a fault. The feel of the slide and spring is factory equal. Shooting hundreds of .22's with the full weight and feel and aim of the 23 is not only great for learning firearms and pistol technique, its great for practice for the seasoned shooter. I can't say enough about how great it is to shoot .22's from my primary sidearm as compared to a couple of other .22 pistols I own (though both are good in their own right). For learning, instructing, and putting hundreds and hundreds down range in my medium size Glock, this is the best. This is the neatest thing I could buy myself for my birthday, I just got back from the range and I REALLY enjoyed shooting it on my Glock lower. Great set up for practice and a lot cheaper. THANKS Lenny for carrying a great product. Never fear, there is a quick remedy for those slide locks that don't fully lock in the upper position after placing the Advantage Arms slide onto the Glock frame. There's nothing wrong with it, so don't think the conversion slide needs to be returned. Although sometimes simply racking the slide a couple of times allows the slide lock to seat itself properly, there is an even quicker, and more positive solution for locking the slide onto the frame. Simply enough, after mounting the slide onto your Glock frame, just take your thumb and push the front of the barrel rearward into the slide and watch how the slide lock magically snaps into its fully locked upward position. I took this conversion kit to the range with my son and daughter. My son and I shot 9mm for a few mags and then I installed the conversion kit. The switch from the factory slide to the Advantage Arms conversion slide was extremely easily. My daughter was very nervous about shooting the pistol after see the recoil of the 9mm. I showed her proper grip and she had a blast. This is a great tool for teaching shooters to shoot without the recoil and cost of normal ammunition. I didn't take a chance on using regular .22LR ammunition and went with the recommended CCI ammo. You can't go wrong with this purchase. I have a Glock 19 Gen 4 that has the Pyramid Trigger kit installed. This .22LR Conversion Kit Works GREAT on it. You can do a simple mod to the Magazine to remedy any FTE's you may get. The kit does seem to favor CCI 40 grain, but I have had good luck with Federal, Norma Tac-22, and CCI mini mag 36 grain. I have had less FTE and FTF issues with this Kit than I have with my S&W MP22 Compact. Follow the instructions for assembly and lube carefully. Just purchased the Advantage 22 conversion kit for my Gen4 Glock 19. What a surprise! Just completed shooting a 500 round pack of the recommended CCI Mini-Mags. No feeding or ejection failures! Just a drop of oil on the recommended points at 100 round intervals between switches to my 9mm upper. No detailed cleaning. Initially, after a couple of magazines, I made an elevation adjustment (U-1click), I was able to keep 3 shots in 1" slow fire, remaining 7 shots in 2.5" rapid fire at 25 feet in my basement range. Great practice! Bought one for the 19 to get the wife used to the household pistols, and perhaps graduate her from my S&W 622 .22 pistol (which she loves to death but is a bit large for carry!). Ammo is everything. When I got it, only had some Remington Golden Bullet 40 grain High Velocity .22, which I thought might suffice... FTF once or twice, FTE on EACH round. Bought a box of CCI Mini-Mag High Velocity Ammunition (36 grain - mini-mag was the term, grain was not noted) as recommended, not a single FTF/FTE, she was much more comfy with it, and my accuracy at 15 yards surprised me - 3 inch group first mags, and I'm no marksman. Since she's hung up on recoil but loves to shoot 22 (and is quite accurate with it) I am seriously considering buying a g26 kit for my G26... if she likes that, might buy her a dedicated G26 + the AA g26 conversion as well to make her dedicated carry pistol. Random note, snap caps won't feed from the magazine. Bought mine for a Gen 3 Glock 19. After a quick cleaning took it out for the first time & shot over 200 rounds of CCI Mini-Mags 40 grain (the recommended ammo). It performed flawlessly, was extremely accurate, & provided very nice groupings. Was impressed with the quality of this conversion set up. Very Satisfied & would definitely recommend it to others! Received the kit for my G27 and headed to the range. Found the groups were hitting approx. 3" high and to the left. Rear sight was lodged in the far left position. Sight tool bent trying to make an adjustment. Was able to loosen with a precision screwdriver and centered the groups moving the adjustment far right. Bottomed out the elevation adjustment but still was grouping 2 - 3 inches high. Contacted Glockstore and was advised the groupings may be shooters error (45 years LE and proficient shooter ... don't think so) but said I should check with Advantage Arms. Contacted Advantage Arms and found customer service to be exceptional!!! Displayed a true concern for the problem and resoled the situation within a few days which included the shipping of replacement parts. Extremely satisfied with the kit and Advantage Arms. Still give them a 5. Groups consistently center just like the 40 cals. Fits my polymer 80 sub-compact frame but I haven't been able to get it to fire semi-auto. When I called Glock Store with all the data they put me on hold for a little bit then came back and told me they are not meant to work with polymer 80 frames which make no sense to me since the frame seems to have very little to do with the recoil and picking up another round. I'm not sure what the malfunction was but I didn't even feel much recoil if anything. I'm going to try a much heavier round and see if that works. Maybe I'll attempt to put a lighter recoil spring in it and see if that helps too. So only 4 stars since I could not get it to work quite right, but fits are as far as I can see to Glock specs. Bought one for my G20 so my wife could practice with it, not to mention the ability to practice with very cheap ammo. However, be very careful to use on,y the recommend brands as the assembly is a little wonky with many popular ammo brands. Regardless, why not have 2 guns in one! A early Christmas for me but I will share with my wife and daughter. I mounted the unit on my Glock 17 Gen 3 and was 100% perfect with 160 rounds down range. 60 rounds were CCI Mini-Mag 36 grain HP which AA does not recommend but they functioned perfectly. Next range visit my wife and daughter will participate.